Welcome to the Venezuelan internet. Luis Carlos and Naky will be your guides. 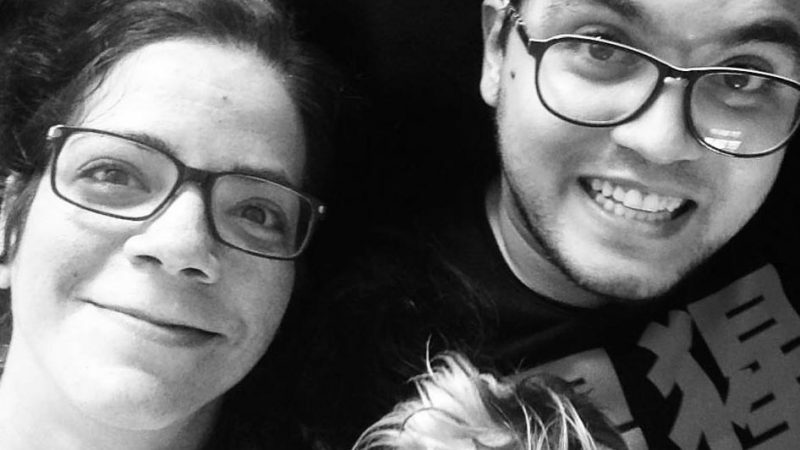 Naky (left), Luis Carlos (rigㅇht) and their dog, Pepe’s, nose (bottom). Photography taken from Luis Carlos’ Facebook profile, used with permission. After years of censorship, constant power cuts, dwindling presence of non-state media, and vicious political polarization, the internet in Venezuela has become a very complicated place. It is even a battle ground within the political conflict. Trying to find and make sense of information online has become really, really hard. But we are not alone in our struggle. In this murky and uncertain milieu, thousands of Venezuelans inside the country and abroad have found a special person, a guide who knows how to read in the dark. His name is Luis Carlos Díaz. He is a journalist, a geek, a foodie and a collaborator here at Global Voices. His name made headlines last week when he was detained by government authorities in Caracas. Yet most of us know him not as story subject, but as a person who is making the media, constantly, and on his own terms. Luis Carlos and I go way back. We met at university, had a couple of classes together and became very good friends. He made me read Kapuscinski for the first time, showed me how it inspired him to write about journalism for peace, and pushed me to start my own blog. We even opened a blog together with another friend of ours, a space to comment on everything we found hilariously cheesy around us. He also invited me to join Global Voices. A few years later, Luis Carlos met a real-life wonder woman named Naky Soto, who would become his main collaborator in work and in life. Naky is a communications professional who talks of little else but defending people’s rights and performing citizenship. The rest is easy to guess. They fell in love, got married, and started a life together. Over the past ten years, Naky and Luis Carlos’ work on various internet platforms has become a touchstone for many Venezuelans as the country has fallen into crisis and the community of Venezuelans outside the country grew rapidly. During this time, censorship intensified (in all forms), and online networks became our most reliable source of information. Naky and Luis Carlos became some of the most recognized and trusted readers of the situation. They were fast to learn about new communication tools and processes, and even faster to sniff out political motivations and controversy on the national stage. Together, they found ways to explain all of this using a combination of serious analysis, references to pop culture and their signature wit. For one of their first projects, “Political Hangouts,” they used Google Hangouts to explain what was going on in Venezuela. People would get online and participate, commenting and asking questions. Soon after, Naky began posting daily summaries on Facebook, where you could learn what was going on, and understand why it mattered. She also became a prolific photographer, posting photos of unique insects (#Bichos) and plants that refused to give away their place to the city’s concrete in her photo series #Tercas (stubborn). For all of those who fight “stubbornly” to achieve a respectful, responsible and free country, I’m putting here some pictures of plants growing in unlikely places. The first: life does not know or respect locks, prison or censorship. Naky and Luis Carlos’ conversations in Hangouts, on Telegram and on Twitter have become popular at universities and in public spaces around the country and the region. They are not just in it for the followers, but the numbers are impressive. Alongside tens of thousands of followers on Instagram and views on YouTube, they have nearly half a million followers on Twitter (@LuisCarlos and @Naky) between the two of them. From Luis Carlos and Naky, we’ve learned how best to read all kinds of media, how to deal with bad internet service, how and why it is important to register, document, and denounce abuses. They have taught us how to be careful with the information we have and share, what media sources were trustworthy, how to be patient with family members spamming our WhatsApp groups with fake news. WhatsApp is down. This is a good moment for an ad: Telegram is still accessible and we’re a bunch of people having a great time over there. He recently created a short video about hackers. The framing message was: “befriend a hacker, love your hacker, learn how they operate because, at the end, we’ll all become one”. 💻 ¿Sabes qué son los #hackers y por qué los necesitamos? Most recently, they have launched a Patreon project where subscribers and supporters can find analytical videos and episodes of “En serio” (in Spanish, “seriously”), their latest collaboration, where they help viewers make sense of the latest wave of political events taking place in the country, which can be remarkably difficult to comprehend. 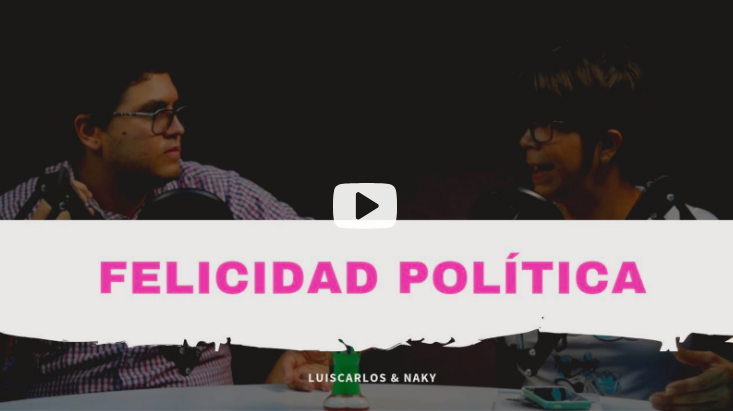 Screenshot of the episode “Political Happiness”, part of the series #EnSerio (Seriously), taken from Luis Carlos’ Patreon channel. Venezuela has changed so rapidly, so violently, and so weirdly, that the only way to make sense of it all was to connect with a network of people, inside the country and out. Over the years, these two people have shown so many of us that learning does not need to be limited to certain spaces, and that it can happen in collaboration, connecting people, in constant evolution, surpassing obstacles, and lighting pathways for those who are struggling to find their way. Through their work, thousands of us — friends and followers and collaborators — found ourselves in a network. We’ve found ways to learn from them, and from each other. As we look ahead, it’s clear. Our network is exactly what we need to keep going.